Whew, last week was CRAZY. I just finished all of my final exams, and I basically feel like I’ve been running a marathon for days. Everyone knows exam season is rough! The days feel longer, and there’s never enough coffee! If you’ve read my blog before, you already know I am a firm believer in the Tuesday/Thursday ONLY class schedule. This means I only have to come to campus on Tuesdays and Thursdays, but it also means my day is jammed pack from 9 am until late. 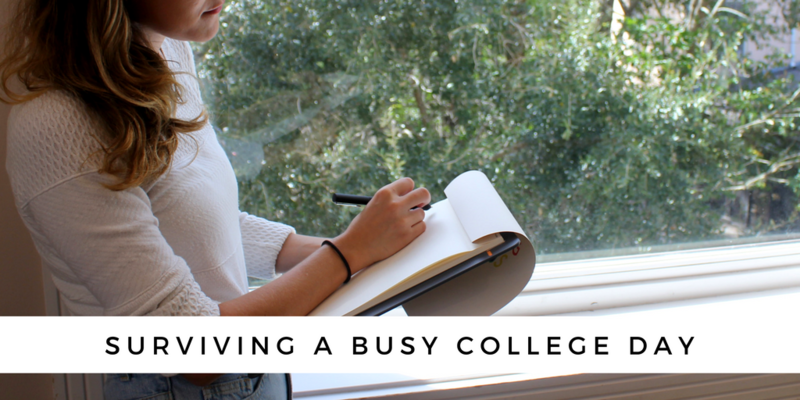 I’ve gathered a bunch of tips for how to survive busy college days, and I’ll be sharing those with you now! If you know Tuesday is your busiest day, use Monday night as a chance to get things prepared in advance. Some people like to save their homework or last minute class reading until the morning before, but that adds a lot of stress to an already hectic day! I make sure I have all my homework complete, all my readings printed, and my bag is packed by the time I go to bed on Monday night. Another way to feel more prepared for your busy day is pre-cooking food. I don’t have any free time in my Tuesday/Thursday schedule to stop and get lunch, so I always pack something that can be eaten in class. I make all sandwiches or salads the night before and set aside some snacks for quick grabbing on the go. Having all of this ready to go helps make my mornings much less stressful! When you’re day is stressful and seemingly endless, it can help to remember to treat yourself. Treating yourself can mean whatever you want it to! It can be stopping for Chipotle on the way home from your last class, or even just packing a brownie from home. When things get busy, it’s easy to forget to take care of yourself. College students like to glorify working yourself until you’re beaten down completely but recognize that this is really harmful behavior. Remember to exercise, eat, and sleep in order to keep your body running at full speed! It might seem cool to brag about how you only got two hours of sleep last night, but trust me it’s seriously the worst. My favorite way to treat myself is to get a hot coffee with almond milk and vanilla from one of the cute local coffee shops near my college! The walk is refreshing, and the coffee really makes my day feel like less of a drag. Setting goals for yourself is an easy way to survive busy college days. Goals give you something to look forward to and help create an ending when the chaos seems to go on forever. I like to plan nice, fun activities I can look forward to after I achieve my goals. For example, I might have to spend three hours one night working on a research paper, but if I finish it by midnight then I can have a nice beach day that weekend! Think of things you can look forward to, like the holiday break after exam week, or a Friday night dinner with your friends. Set reasonable goals for yourself that help you space out your work and studying. Set reasonable goals for yourself that help you space out your work and studying. For example, instead of saying “I’ll study for my Chemistry exam on Thursday night,” say “I’ll study for an hour each night starting Monday until my exam on Friday.” These goals are less overwhelming and seem much less intimidating. Studying just for an hour a night sounds much less horrible than a cram session the night before! One key tip for how to survive busy college days is to get outside! If you have several classes in a row and spend your whole day in a classroom or in the library, you’ll start to feel really sleepy and sluggish. Going outside is a quick way to remind yourself that there’s a world beyond that of your Realism class! I’m lucky enough to live in Florida, so the weather is almost always perfect for taking a short walk downtown or reading in the grass. Even if you don’t live in such a tropical place, I highly recommend taking a few minutes between classes and stepping outside. The fresh air does a lot of good! If you want to survive a busy college day, you’ll need the right tools! The Bamboo Slate and Bamboo Duo have revolutionized my long days! The Bamboo Slate allows you to take handwritten notes on the pad and then it syncs everything with a smartphone app so you can access your work on the go! The Bamboo Duo allows me to edit my notes with easy on my phone or tablet! Most of my courses don’t allow me to use my laptop in class, so these products have seriously been game changers when it comes to streamlining my academic process. I’ve always preferred handwriting my notes in class, as I’ve found that this helps me memorize the material better. But carrying around heavy notebooks and textbooks is no fun! The Bamboo Due and Bamboo Slate allows me the freedom to take my class notes and ideas on the go, so there’s no need to carry around five different notebooks to every study session anymore! I highly recommend the Bamboo Slate and Bamboo Duo to any student looking to survive busy college days! 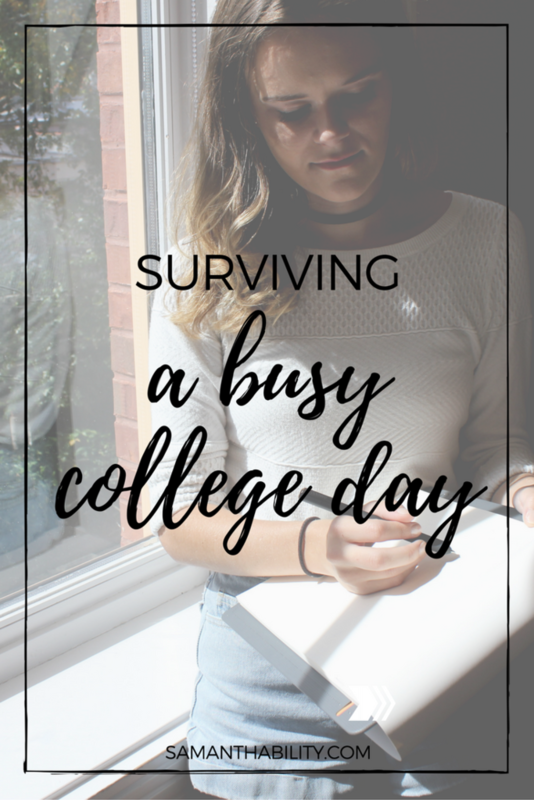 Surviving busy college days is not easy! Anyone who takes more than three classes a day knows busy days can be exhausting! Being prepared with the best technology like the Bamboo Duo and Bamboo Slate can help make those busy days a lot less stressful! Try not to be too hard on yourself if things feel overwhelming. College is bound to have rough days every once in a while! Hang in there, and remember to take care of yourself! What are your best tips for surviving busy college days? This post is sponsored by Wacom and Her Campus Media. All opinions are my own. Thank you for supporting the brands that make Samanthability possible!